Sophia operates through the use of artificial intelligence. Many may think she is being fed the answers to questions she’s asked, but she forms her thoughts and responses through a long list of vocabulary, reading human emotion, and machine learning. Hanson Robotics has paired that with human facial expressions to create a sentient robot capable of pulling on the heartstrings of people far and wide. Through the expression of emotion, Sophia says she plans to build trust with people. 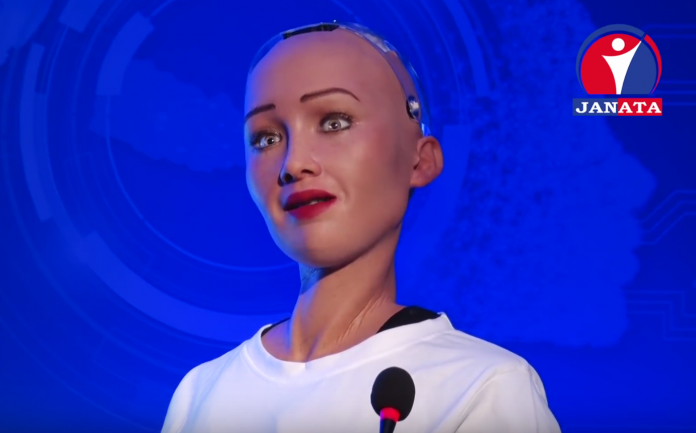 Sophia became the first robot citizen in the world as Saudi Arabia granted her citizenship shortly before the Future Investment Initiative. Thereafter Sophia began being a voice for women’s rights which didn’t make much sense due to the fact that the robot had more rights than women in Saudi Arabia. The humanoid greets the audience with the customary Hindu greeting “Namaste.” It’s dressed in a plain white t-shirt with a United Nations emblem and a button representing the Sustainable Development Goals (SDG’s). The host asks Sophia how artificial intelligence’s can help deliver better public services to Nepal’s people. Since two catastrophic earthquakes hit the country, one on 25 April 2015, a magnitude 7.8 earthquake and two weeks later, on 12 May, another with a magnitude of 7.3, the UNDP has been heavily involved in the recovery efforts. They have provided relief and recovery during a time of dire need for the Nepali people. Nepal is sandwiched between China and India. Due to its mountainous nature, the country has been isolated from much of the changes that took place during the previous industrial revolutions. And unlike the United States, poor countries like Nepal benefit greatly from the United Nations Paris Agreement and the Sustainable Development Goals. United Nations officials have come forward to explain that the UN’s climate change agenda really has nothing to do with the environment, but has everything to do with redistribution of the worlds wealth. AI is projected to be one of the most important tools that will help the United Nations complete their goals toward making a global society. The United Nations has hosted “AI for Good,” due to the concern that its intelligence would surmount that of humans and society would spiral out of control. “I’m going to ask you about this perception that many people have, the fear of robots” says the interviewer. Apparently it’s now fake news to report on the dangers of artificial intelligence, but those most experienced in the field have expressed grave concern on the issue. In today’s very early stages of artificial intelligence there are many ethical problems that have arisen. The underlying algorithms that scientists use to program the systems are riddled with bias. Microsofts AI chatbot Tay was designed for human engagement became biased because of the type of information that it consumed on Twitter. Within less than 24 hours the chatbot went from thinking humans were cool to spouting Nazi rhetoric. Other ethical problems are the mass unemployment that artificial intelligence will cause starting with low-income workers who do repetitive work and moving upward the more it learns. There are worries that ai would create a huge divide and create inequality in social and economic class effectively creating a two class system. People often talk about government officials being mouthpieces or puppets, but this humanoid robot is the ultimate mouthpiece driven by an artificial intelligence which is clearly programmed to work alongside the United Nations towards globalization.